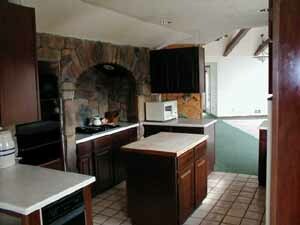 This is the finest rental home in the Gore Mountain - Lake George Region. Located just five minutes from Gore Mountain and twenty minutes to Lake George, The Lookout has a lovely view from the 25' by 26' living area. What makes this house unique is the private indoor swimming pool. This home is not for everyone. Partiers beware; spilled wine on this carpet could cost you a month's income. 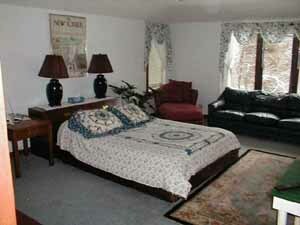 There are a full sized washer and dryer to freshen your linens during the stay. 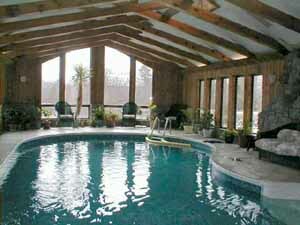 The indoor pool is a 24 by 12 kidney shaped from 3 to 6 feet in depth. The house is handicap accessible with a Swedish shower. The house also has three garages for your use. For summer use the house is completely air-conditioned. 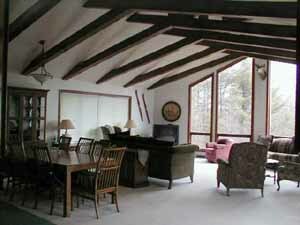 A new family room in the lower level is completely pine walled.